Captain Marvel is being set up as the most powerful character in the Marvel Cinematic Universe, so it’s time for the comics to lean into that strength and reinforce Carol Danvers as a heavy hitter. That’s exactly what you get in the new Captain Marvel series from writer Kelly Thompson, artist Carmen Carnero, colorist Tamra Bonvillain, and letterer Clayton Cowles, which puts Carol back in New York City and gives her plenty of opportunities to beat down on baddies. Last month’s first issue of Captain Marvel was a huge success, delivering easy exposition for newcomers that doesn’t drag down the momentum, widescreen action, superhero friendships, a revived romance, and a cliffhanger that takes a sharp left turn for the book’s first arc. 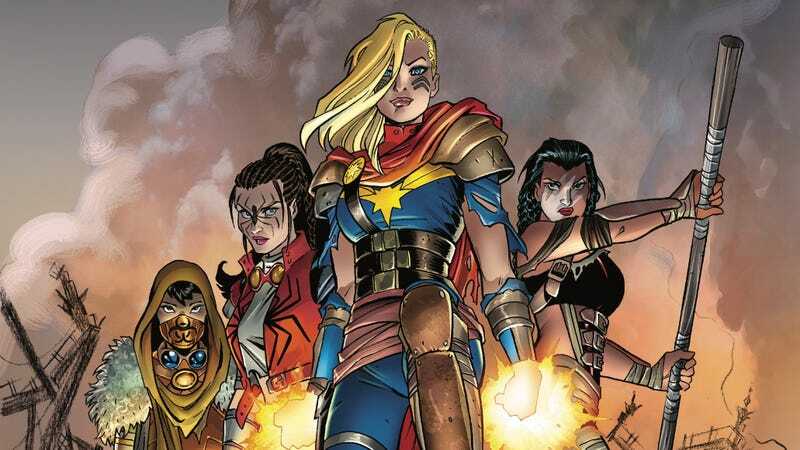 Captain Marvel is on her way to becoming a revolutionary leader in an apocalyptic wasteland, and this creative team has a lot to explore in regards to Carol’s journey with fellow survivors Spider-Woman, Echo, and Hazmat. This exclusive preview of next week’s Captain Marvel #2 reveals the hero’s first moments in the annihilated Roosevelt Island she teleported to at the end of #1, and not much has changed as she continues her fight with the Russian supervillain, Mahkizmo. Thompson uses Mahkizmo as an exaggerated mouthpiece for the misogyny the character and her creative teams have had to deal with from the fan community as women assume bigger roles in the very much male-dominated Marvel Universe (both comic and cinematic). This adds an extra layer of catharsis to Carol’s hits, which land with devastating force thanks to Carnero, Bonvillain, and Cowles’ artwork. That first kick gets the center of a two-page spread, and Carnero uses costume and environmental details to accentuate the action of Mahkizmo getting knocked back. Carol’s scarf aligns with her leg, which picks up pieces of wreckage as it moves through the air and smashes into Mahkizmo’s face. The wreckage arcs down and eventually meets with the blood surging from his nose, and the bottom of his coat adds a flip motion as it catches the wind. Mahkizmo’s white hair and coat make him stand out against the pink, purple, and orange in the background, and a radiating “BOOM” sound effect from Cowles is the final touch that boosts power with big letters and pops of solid colors. This art team understands how to emphasize strength, making it a great fit for Thompson’s story.